Shakugan no Shana light novel volume 1, featuring Shana. Shakugan no Shana (灼眼のシャナ, lit. Burning-Eyed Shana), also known simply as Shana (シャナ), is a Japanese light novel series written by Yashichiro Takahashi with illustrations by Noizi Ito. ASCII Media Works published 26 novels from November 2002 to November 2012 under their Dengeki Bunko imprint. The story focuses on Yuji Sakai, a high school boy who inadvertently becomes involved in an age-old conflict between forces of balance and imbalance in existence. In the process, he befriends a fighter for the balancing force and names her "Shana". The series incorporates fantasy and slice of life elements into its tale. Two manga adaptations were published by ASCII Media Works in Dengeki Daioh and Dengeki Maoh. Between 2005 and 2012, the series was adapted by J.C.Staff into three 24-episode anime television series, a four-episode original video animation (OVA) series, an animated film and an additional stand alone OVA episode. A PlayStation 2 video game was released in March 2006, and it was ported to the Nintendo DS in March 2007. Viz Media licensed the novels and the first manga series for release in North America, but stopped publishing both prematurely. Geneon originally licensed the first television series for release in North America, but the license later transferred to Funimation, who also licensed the remaining anime properties. Critics praised the series for its execution of typical story elements and how it continuously becomes better over time. Shakugan no Shana details an age-old conflict between those who inhabit the Crimson Realm (紅世, Guze), a parallel universe to the human world. The Crimson Realm is populated by Crimson Denizens (紅世の徒, Guze no Tomogara) who are able to manipulate the Power of Existence (存在の力, Sonzai no Chikara), a fundamental power within any biological entity and functions as "fuel" for one's existence. Denizens whose power stands out among their peers are known as Lords of the Crimson Realm (紅世の王, Guze no Ō), and Lords that are even more powerful are known as Gods (神, Kami). Denizens who do not care about the balance between the Crimson Realm and the human world collect Power of Existence from humans to use for their own purposes. It is the duty of Flame Hazes (フレイムヘイズ, Fureimu Heizu), humans who have formed contracts with a Crimson Lord, to maintain the two worlds' balance by killing any Denizens disrupting it. Denizens and Flame Haze fight with the use of powerful magic spells called Powers of Unrestraint (自在法, Jizaihō), which are also known as Unrestricted Spells or Unrestricted Methods. One such spell is the Seal (封絶, Fūzetsu), which creates a space where the Crimson Realm and the human world intermingle and all sorts of causalities, including time, are stopped for ordinary living beings. The story largely takes place in Misaki City in Japan and begins when high school student Yuji Sakai is thrown into the middle of this conflict and encounters a Flame Haze girl with flaming red eyes and hair dressed in all black wielding a katana. The girl informs him that he died some time ago, and that he is a Torch (トーチ, Tōchi), a human with greatly diminished Power of Existence, and whose remaining Power of Existence will slowly run out. In addition, Yuji is a Mystes (ミステス, Misutesu), a special kind of Torch who contains a Treasure Tool (宝具, Hōgu), a magical object created by Denizens that can provide special abilities or even Powers of Unrestraint; additionally, Mystes can move within Seals. Unfazed by his apparent death, Yuji befriends the girl and names her "Shana" after her sword. They later discover that the Treasure Tool within Yuji is the Reiji Maigo (零時迷子, Midnight Lost Child), which restores his Power of Existence every night at midnight. As time goes on, Shana and Yuji encounter several more Flame Haze, such as Margery Daw and Wilhelmina Carmel, and Denizens in Misaki City. An organization of Denizens called Bal Masqué discovers that Yuji possesses the Reiji Maigo and attempt to use the Treasure Tool on two separate occasions. Bal Masqué is led by three Lords called the Trinity: Hecate, Sydonay, and Bel Peol. They serve under a Crimson God known as the Snake of the Festival (祭礼の蛇, Sairei no Hebi), who resides within the Reiji Maigo. When the Snake of the Festival emerges, it merges its consciousness with Yuji's, assuming command over Bal Masqué, and together they formulate an elaborate plan to create a parallel world called Xanadu, which will serve as a paradise for Denizens with unlimited Power of Existence. Shana, and all of the other Flame Haze around the world, oppose the creation of Xanadu, which would eventually cause a large-scale disruption in the human world, the Crimson Realm and Xanadu itself. Shana formulates a countermeasure and is ultimately successful in adding a single law to Xanadu where the Denizens are not allowed to eat humans anymore. With Xanadu created, the Denizens depart to the new world, soon followed by hundreds of Flame Haze determined to help enforce order on it. Yuji intends to go to Xanadu alone and make sure humans and Denizens can eventually learn to coexist, but Shana refuses to be left behind. In the end, Yuji accepts Shana's feelings and the two kiss, which activates a spell left to Yuji by Crimson Lord Lamia that restores his existence, so Yuji is no longer a Torch. With the help of another spell from Lamia, Yuji successfully restores all humans in Misaki City whose existence was absorbed by the Denizens before he and Shana depart for Xanadu together. In an early draft of what would later become Shakugan no Shana, Yashichiro Takahashi set the story in a different dimension and described the main character as having the initial personality of Shana, but the appearance of an older woman similar to Margery Daw. However, after talking with an editor, Takahashi rewrote the character to have the appearance of a young girl. In doing so, he used Shana's small build to symbolize a story of growth and to emphasize the physical conflict between her and her opponents. Noizi Ito was contacted in early August 2002 to be the illustrator for the series, and she was very excited to work on the project after she read the manuscript for the first novel; this was the first time Ito drew illustrations for a book. Shortly before writing Shakugan no Shana, Takahashi made his debut as an author with A/B Extreme, which was awarded an honorable mention in the eighth Dengeki Novel Prize by MediaWorks (now ASCII Media Works) in 2001. By his own admission, A/B Extreme was too difficult for readers to understand, so for his next work, he set out to write something easier to grasp. As such, the initial premise of Shakugan no Shana was to write a boy meets girl story in a school setting, though initially love was not one of the themes included. He was given the freedom to write as he pleased based on this premise after showing it to his editor. Shakugan no Shana began as a light novel series written by Yashichiro Takahashi, with illustrations drawn by Noizi Ito. ASCII Media Works published 26 volumes between November 9, 2002 and November 10, 2012 under their Dengeki Bunko imprint; 22 comprise the main story, while the other four are side story collections. A short story was later published in the September 2017 issue of ASCII Media Works' Dengeki Bunko Magazine. Viz Media licensed the novels for English distribution in North America, but they only released two volumes in 2007. The novels are also licensed in South Korea by Daewon C.I., and in Taiwan and Hong Kong by Kadokawa Media. A 160-page guide book titled Shakugan no Shana no Subete (灼眼のシャナノ全テ, All About Shakugan no Shana) was published on December 10, 2005 by ASCII Media Works. Two more guide books were published by ASCII Media Works for the anime adaptations: Anime Shakugan no Shana no Subete (アニメ 『灼眼のシャナ』 ノ全テ) on October 27, 2006 with 176 pages, and Anime Shakugan no Shana II no Subete (アニメ 『灼眼のシャナII』 ノ全テ) on October 19, 2009 with 168 pages. Four 128-page Noizi Ito art books were published by ASCII Media Works: Guren (紅蓮) on February 25, 2005, Kaen (華焔) on August 9, 2007, Sōen (蒼炎) on August 10, 2009, and Shana (遮那) on August 9, 2013. A manga adaptation, illustrated by Ayato Sasakura, was serialized in ASCII Media Works' manga magazine Dengeki Daioh between the April 2005 and October 2011 issues. The individual chapters were collected and published in ten tankōbon volumes from October 27, 2005 and October 27, 2011. A special limited edition version of volume two was bundled with a booklet titled Grimoire including contributions from guest artists and writers for various illustrations, manga, and short stories. Viz Media licensed the manga for English distribution in North America. Viz released six volumes between April 17, 2007 and September 21, 2010, but then cancelled the release of the final four volumes. The manga is also licensed in South Korea by Daewon C.I., in Taiwan and Hong Kong by Kadokawa Media, and in Germany by Egmont. A second manga illustrated by Shii Kiya, titled Shakugan no Shana X Eternal song: Harukanaru Uta (灼眼のシャナX Eternal song -遙かなる歌-), is based on the events of the tenth novel and began serialization in ASCII Media Works' manga magazine Dengeki Black Maoh on September 19, 2007. The manga was later transferred to Dengeki Maoh and ran in that magazine between the December 2009 and September 2012 issues. Five volumes were released between January 27, 2009 and September 27, 2012. The manga is licensed in South Korea by Daewon C.I., and in Taiwan and Hong Kong by Kadokawa Media. A 24-episode anime television series adaptation of Shakugan no Shana aired in Japan between October 6, 2005 and March 23, 2006 on TV Kanagawa. Produced by J.C.Staff and directed by Takashi Watanabe, the screenplay was written by Yasuko Kobayashi, and chief animator Mai Otsuka based the character design used in the anime on Noizi Ito's original designs. The sound director is Jin Aketagawa, and the soundtrack is composed by Kow Otani. The series was later released by Geneon in eight DVD compilation volumes from January to August 2006. Later, an original video animation (OVA) episode titled Shakugan no Shana SP, which takes place after the events of episode 13, was released on December 8, 2006. An anime film based on the first novel that was released in Japanese theaters on April 21, 2007 as one of three films released at Dengeki Bunko's Movie Festival. The staff who produced the anime series returned to produce the film. The version shown in theaters was 65 minutes in length. Those who saw the film in theaters could buy a short book titled Shakugan no Shana M containing two short stories written by Takahashi published by ASCII Media Works under the imprint Dengeki Gekijō Bunko. The film was released on DVD in Japan on September 21, 2007 in regular and special editions, which featured the full length 90-minute director's cut version. It was later released on Blu-ray Disc (BD) in Japan on July 27, 2011. Shana's production staff would again return to produce two additional TV series and an OVA series. The 24-episode second season, titled Shakugan no Shana Second (灼眼のシャナⅡ), aired between October 5, 2007 and March 28, 2008 on MBS. The series was later released by Geneon to eight DVD compilation volumes from January to August 2008. A four-episode OVA series titled Shakugan no Shana S was released on BD/DVD from October 23, 2009 to September 29, 2010. The 24-episode third season, titled Shakugan no Shana Final (灼眼のシャナIII -Final-), aired between October 8, 2011 and March 24, 2012 on Tokyo MX. The series was released by Geneon on eight BD/DVD compilation volumes from December 2011 to July 2012. Geneon licensed the first TV series for North American distribution, but after Geneon withdrew from the North American market, Funimation Entertainment took up the manufacturing, marketing, sales and distribution rights, though Geneon still retained the license. A DVD box set was released by Funimation in September 2008, and was re-released in September 2009 under Funimation's "Viridian Collection". Funimation later re-licensed the first series and re-released it in a BD/DVD combo pack on August 21, 2012. The series made its North American television debut on September 10, 2012 on the Funimation Channel. The first season and its accompanying OVA were also licensed by Madman Entertainment in Australia and New Zealand, and by MVM Films in the United Kingdom. Funimation later licensed the film, the second and third TV series, and the OVA series for release in North America with a different English dub cast compared to the first anime season. For the first Shakugan no Shana anime series, four theme song singles were released for two opening and two ending themes. The first opening theme "Hishoku no Sora" (緋色の空, The Crimson Sky) by Mami Kawada was released in November 2005, and the second opening theme "Being" by Kotoko was released in March 2006. The first ending theme "Yoake Umarekuru Shōjo" (夜明け生まれ来る少女, The Girl Born at Dawn) by Yoko Takahashi was released in October 2005, and the second ending theme "Aka no Seijaku" (紅の静寂, Crimson Silence) by Yoko Ishida was released in February 2006. The original soundtrack for the first anime series was released in January 2006. For the Shakugan no Shana film, two theme song singes were released: the ending theme "Tenjō o Kakeru Monotachi" (天壌を翔る者たち, Those Who Scale Heaven and Earth) by Love Planet Five—made up of Kotoko, Kawada, Eiko Shimamiya, Mell, and Kaori Utatsuki—was released in April 2007; the insert song "Akai Namida" (赤い涙, Red Tears) by Kawada was released in May 2007. The film's original soundtrack was released in September 2007. For Shakugan no Shana Second, two theme song singles were released for two opening and two ending themes. The first opening theme "Joint" by Kawada was released in October 2007, and the second opening theme "Blaze" by Kotoko was released in March 2008. The first ending theme is "Triangle" by Kawada and was released on the single for "Joint", and the second ending theme "Sociometry" by Kotoko was released on the single for "Blaze". The song "Sense" by Kawada was used as the final ending theme for episode 24, and was released on Kawada's album Savia in March 2008. The original soundtrack for Shakugan no Shana Second was released in January 2008. For Shakugan no Shana S, the single for the opening theme "Prophecy" by Kawada was released in November 2009, and the ending theme "All in Good Time" by Kawada was released on her album Linkage in March 2010. The song "Portamento" by Kawada was used as an insert song in episode 4, and was released on Savia. For Shakugan no Shana Final, four theme song singles were released for two opening and two ending themes. The first opening theme "Light My Fire" by Kotoko was released in November 2011, and the second opening theme "Serment" by Kawada was released in February 2012. The first ending theme "I'll Believe" by Altima was released in December 2011, and the second ending theme "One" by Altima was released in February 2012. The song "Kōbō" (光芒, Beam of Light) by Kawada was used as the final ending theme for episode 24. Three insert songs by Kawada were also used in Shakugan no Shana Final: "u/n" in episode 15 released on the single for "Serment", "Akai Namida" in episode 19, and "Hishoku no Sora" in episode 24. Three volumes of albums titled Shakugan no Shana Assorted Shana containing image songs, audio dramas and background music tracks were released between February and April 2006. Three volumes of albums titled Shakugan no Shana II Splendide Shana containing images songs and audio dramas were released between February and May 2008. Three volumes of albums titled Shakugan no Shana F Superiority Shana containing audio dramas, background music tracks, and short versions of theme songs from Shakugan no Shana Final were released between February and July 2012. The third Superiority Shana album also included the song "Kōbō". A compilation album of songs used in the series was released on January 24, 2018. A weekly radio drama of Shakugan no Shana aired four episodes between November 29 and December 20, 2003 on Dengeki Taishō. The scenario was an original side-story written by Takahashi, and takes place between the first and second light novel volumes. The cast for the radio drama was different from the anime adaptations. A CD compilation of the radio drama titled Shakugan no Shana Drama Disc, including an additional audio drama, was eligible for mail orders up to March 31, 2004. Another drama CD was released with the April 2008 issue of Tokuma Shoten's Animage magazine; the cast is the same as with the anime versions. An action RPG visual novel titled Shakugan no Shana, developed by Vridge and published by MediaWorks, was released on March 23, 2006 for the PlayStation 2 (PS2). A 36-page A4-sized art book titled Honō (焔) featuring illustrations by Ito was available to those who pre-ordered the game. The game was re-released as a "Best" version on February 7, 2008. The story was written by Takahashi, and features character designs by Ito. The opening theme song is "Exist" by Rie Kugimiya, which was released on volume one of the Assorted Shana albums. The player assumes the role of Yuji Sakai during the visual novel aspect, where much of the game's duration is spent on reading the text that appears on the screen, which represents the story's narrative and dialogue. The game follows a branching plot line through eight chapters with five possible endings, and depending on the decisions that the player makes during the game, the plot will progress in a specific direction. Every so often, the player will come to a point where he or she is given the chance to choose from multiple options. Text progression pauses at these points until a choice is made. To view all plot lines in their entirety, the player will have to replay the game multiple times and choose different choices to further the plot to an alternate direction. Sometimes during text progression, an "active countdown" minigame appears, which requires the player to press the game buttons in a specific order in a set time limit. Success or failure in these minigames influence which endings are viewed. During the turn-based battle sequences, the player assumes the role of Shana. The player uses a combination of fire, powers of unrestraint, and treasure tools to battle Crimson Denizens; and Shana is also able to use a special attack and defend. A Nintendo DS port of the game titled Shakugan no Shana DS, developed by Vridge and published by MediaWorks, was released on March 29, 2007. Those who pre-ordered the game received a calendar spanning April 2007 to March 2008, and an art book of rough sketches by Ito titled Tōka (灯火) was available for a limited time with the purchase of the game. A new story for the DS version was written by Takahashi. The game also contains an image gallery that allows the player to see what Shana and Yoshida Kazumi look like in different clothes, and a battle mode that lets the player fight against the computer with a character other than Shana. Shana appears as a playable character in the crossover RPG Dengeki Gakuen RPG: Cross of Venus for the Nintendo DS, and other characters from Shakugan no Shana also appear in the game. Shana appears in the 2014 fighting game Dengeki Bunko: Fighting Climax, which features various Dengeki Bunko characters. In October 2014, the novels were reported to have sold over 8.6 million copies. As reported on the obi strip on volume 4 of the Shakugan no Shana manga released in January 2008, 1.2 million copies of the manga had been sold. Theron Martin from Anime News Network reviewed the manga and called it "inferior" to the anime, and notes the anime develops characters better than the manga. Martin also critiques the art, saying the background art has little detail, and while the action scenes are handled well enough, they are still sub-par compared to the same scenes in the anime. Martin concludes the review by warning the readers that "[if] this is your first exposure to the franchise, look to the anime version to see it done right." When reviewing the anime, Martin thought the first Shakugan no Shana always manages to slightly exceed expectations, and while its story elements may be typical, its execution is not. Martin noted that Shana's Flame Haze transformation is a visual highlight of the series, and other details are shown equal care. Reviewer Chris Beveridge of Mania.com felt uncomfortable about the morbid nature of the series. While Beveridge did not think the series is "groundbreaking", it proves to be a "solid title" that continuously gets better. The pacing in the middle of the first season was criticized for quickly ending an arc before "going into a storyline that feels out of character for the show." Martin's review of Shakugan no Shana Final was less positive; he described Yuji as having been made into a different character (though his complexity was praised), criticized the addition of a large number of prominent characters without sufficient development, and described some things as not making sense, although he praised Shana's development over the course of the third series. Shakugan no Shana no Subete (in Japanese). ASCII Media Works. 2005. ISBN 978-4-84-023287-6. ^ a b c Shakugan no Shana no Subete 2005, p. 106. ^ a b Shakugan no Shana no Subete 2005, p. 107. ^ 第8回 電撃ゲーム3大賞 入賞作品 [8th Dengeki Game 3 Big Prize Winning Works] (in Japanese). ASCII Media Works. Retrieved September 15, 2012. ^ 灼眼のシャナ [Shakugan no Shana] (in Japanese). ASCII Media Works. Retrieved April 3, 2012. ^ "灼眼のシャナXXII" [Shakugan no Shana XXII] (in Japanese). ASCII Media Works. Retrieved April 3, 2012. ^ 灼眼のシャナ0 [Shakugan no Shana 0] (in Japanese). ASCII Media Works. Retrieved April 3, 2012. ^ "灼眼のシャナS" [Shakugan no Shana S] (in Japanese). ASCII Media Works. Retrieved April 3, 2012. ^ "灼眼のシャナSII" [Shakugan no Shana SII] (in Japanese). ASCII Media Works. Retrieved April 3, 2012. ^ "灼眼のシャナSIII" [Shakugan no Shana SIII] (in Japanese). ASCII Media Works. Retrieved November 9, 2012. ^ "Shakugan no Shana Gets 1st New Story in 4 Years". Anime News Network. August 9, 2017. Retrieved August 11, 2017. ^ "Shakugan no Shana: The Girl With Fire In Her Eyes (Novel)". Viz Media. Archived from the original on October 27, 2007. Retrieved May 7, 2007. ^ "Shakugan no Shana: Fight Day! (Novel)". Viz Media. Archived from the original on October 26, 2007. Retrieved April 3, 2012. ^ 작안의 샤나 1권 [Shakugan no Shana volume 1] (in Korean). Daewon C.I. Archived from the original on July 9, 2013. Retrieved April 7, 2012. ^ 灼眼的夏娜 01 [Shakugan no Shana 01] (in Chinese). Kadokawa Media. Retrieved April 7, 2012. ^ 灼眼のシャナノ全テ [Shakugan no Shana no Subete] (in Japanese). ASCII Media Works. Retrieved April 4, 2012. ^ アニメ 『灼眼のシャナ』 ノ全テ [Anime Shakugan no Shana no Subete] (in Japanese). ASCII Media Works. Retrieved April 4, 2012. ^ "アニメ 『灼眼のシャナII』 ノ全テ" [Anime Shakugan no Shana II no Subete] (in Japanese). ASCII Media Works. Retrieved April 4, 2012. ^ いとうのいぢ画集 紅蓮 -ぐれん- [Noizi Ito Art Book Guren] (in Japanese). ASCII Media Works. Retrieved April 4, 2012. ^ "いとうのいぢ画集II 華焔 -かえん-" [Noizi Ito Art Book II Kaen] (in Japanese). ASCII Media Works. Retrieved April 4, 2012. ^ "いとうのいぢ画集III 蒼炎 -そうえん-" [Noizi Ito Art Book III Sōen] (in Japanese). ASCII Media Works. Retrieved April 4, 2012. ^ いとうのいぢ画集 結 遮那 -しゃな- [Noizi Ito Art Book End Shana] (in Japanese). ASCII Media Works. Retrieved April 29, 2015. ^ 電撃大王 2005年4月号 [Dengeki Daioh April 2005 issue] (in Japanese). ASCII Media Works. Archived from the original on July 9, 2013. Retrieved September 9, 2012. ^ 電撃大王　2011年10月号 [Dengeki Daioh October 2011 issue] (in Japanese). Tohan Corporation. Archived from the original on July 9, 2013. Retrieved September 9, 2012. ^ 灼眼のシャナ(1) [Shakugan no Shana (1)] (in Japanese). ASCII Media Works. Retrieved April 3, 2012. ^ 灼眼のシャナ(10) [Shakugan no Shana (10)] (in Japanese). ASCII Media Works. Retrieved April 3, 2012. ^ "灼眼のシャナ(2) with "GRIMOIRE" 初回限定版" [Shakugan no Shana (2) with "Grimoire" limited edition version] (in Japanese). ASCII Media Works. Retrieved April 6, 2012. ^ "Shakugan No Shana, Vol 1 (Manga)". Amazon.com. Retrieved April 3, 2012. ^ "Shakugan no Shana, Vol. 6". Amazon.com. Retrieved April 3, 2012. ^ "Shakugan no Shana, Vol. 6: Final Volume!". Viz Media. Archived from the original on October 13, 2012. Retrieved April 3, 2012. ^ 코믹스 작안의 샤나 1 [Comics: Shakugan no Shana 1] (in Korean). Daewon C.I. Archived from the original on July 9, 2013. Retrieved April 7, 2012. ^ "Shakugan no Shana 01" (in German). Egmont. Retrieved July 17, 2013. ^ "電撃黒マ王 Vol. 1" (in Japanese). Jbook. Retrieved September 9, 2012. ^ 電撃マ王　2009年12月号 [Dengeki Maoh December 2009 issue] (in Japanese). Tohan Corporation. Archived from the original on July 9, 2013. Retrieved September 9, 2012. ^ 電撃マ王　2012年9月号 [Dengeki Maoh September 2012 issue] (in Japanese). Tohan Corporation. Archived from the original on February 22, 2014. Retrieved September 4, 2012. ^ "灼眼のシャナX Eternal song -遙かなる歌-(1)" [Shakugan no Shana X Eternal song: Harukanaru Uta (1)] (in Japanese). ASCII Media Works. Retrieved April 3, 2012. ^ "灼眼のシャナX Eternal song -遙かなる歌-(5)" [Shakugan no Shana X Eternal song: Harukanaru Uta (5)] (in Japanese). ASCII Media Works. Retrieved September 27, 2012. ^ "작안의 샤나 X Eternal song-영원한 노래- 1" [Shakugan no Shana X Eternal song: Harukanaru Uta 1] (in Korean). Daewon C.I. Archived from the original on July 9, 2013. Retrieved April 7, 2012. ^ "灼眼的夏娜 Eternal song─永恆之歌─I" [Shakugan no Shana X Eternal song: Harukanaru Uta I] (in Chinese). Kadokawa Media. Retrieved April 7, 2012. ^ 灼眼のシャナ(1) [Shakugan no Shana (1)] (in Japanese). Furusaki Yasunari. Retrieved August 8, 2013. ^ a b 第1期スタッフ＆キャスト [Season 1 Staff & Cast] (in Japanese). Shakugan no Shana Production Committee. Retrieved April 3, 2012. ^ "灼眼のシャナ I" [Shakugan no Shana I] (in Japanese). Shakugan no Shana Production Committee. Retrieved April 3, 2012. ^ "灼眼のシャナ VIII" [Shakugan no Shana VIII] (in Japanese). Shakugan no Shana Production Committee. Retrieved April 3, 2012. ^ "OVA「灼眼のシャナ」SP「恋と温泉の校外学習!」" [OVA Shakugan no Shana SP: Off-Campus Study of Love and Hot Springs!] (in Japanese). Shakugan no Shana Production Committee. Retrieved April 3, 2012. ^ "Dengeki Bunko Movie Festival" (in Japanese). Dengeki Bunko. Archived from the original on October 22, 2006. Retrieved February 8, 2007. ^ 上映スケジュール [Showing Schedule] (in Japanese). Shakugan no Shana Production Committee. Archived from the original on April 30, 2007. Retrieved April 3, 2012. ^ スタッフ＆キャスト [Staff & Cast] (in Japanese). Shakugan no Shana Production Committee. Archived from the original on May 5, 2007. Retrieved April 3, 2012. ^ a b 劇場版『灼眼のシャナ』　リリース [Shakugan no Shana film release] (in Japanese). Shakugan no Shana Production Committee. Archived from the original on July 3, 2011. Retrieved September 12, 2012. ^ "劇場版「灼眼のシャナ」－ディレクターズカット－ DVD" [Shakugan no Shana film director's cut DVD] (in Japanese). Shakugan no Shana Production Committee. Retrieved April 3, 2012. ^ "劇場版「灼眼のシャナ」-ディレクターズカット-スペシャルコレクション DVD" [Shakugan no Shana film director's cut special edition DVD] (in Japanese). Shakugan no Shana Production Committee. Retrieved April 3, 2012. ^ "劇場版「灼眼のシャナ」－ディレクターズカット－ Blu-ray" [Shakugan no Shana film director's cut Blu-ray] (in Japanese). Shakugan no Shana Production Committee. Retrieved April 3, 2012. ^ 第2期スタッフ＆キャスト [Season 2 Staff & Cast] (in Japanese). Shakugan no Shana Production Committee. Retrieved April 3, 2012. ^ 第3期スタッフ＆キャスト [Season 3 Staff & Cast] (in Japanese). Shakugan no Shana Production Committee. Retrieved April 3, 2012. ^ "Producer Plans 3rd & Final Shana Series after S OVA". Anime News Network. July 8, 2009. Retrieved April 4, 2012. ^ "灼眼のシャナII 第I巻" [Shakugan no Shana II Volume I] (in Japanese). Shakugan no Shana Production Committee. Retrieved April 3, 2012. ^ "灼眼のシャナII 第VIII巻" [Shakugan no Shana II Volume VIII] (in Japanese). Shakugan no Shana Production Committee. Retrieved April 3, 2012. ^ "New Shana Anime to Be Shakugan no Shana 'S OVA Series". Anime News Network. July 7, 2009. Retrieved July 8, 2009. ^ "OVA「灼眼のシャナS」I" [OVA "Shakugan no Shana S" I] (in Japanese). Shakugan no Shana Production Committee. Retrieved April 3, 2012. ^ "OVA「灼眼のシャナS」IV" [OVA "Shakugan no Shana S" IV] (in Japanese). Shakugan no Shana Production Committee. Retrieved April 3, 2012. ^ "Producer Plans 3rd & Final Shana Series after S OVA". Anime News Network. July 8, 2009. Retrieved July 8, 2009. ^ "Shakugan no Shana III (Final) Anime to Air This Fall". Anime News Network. June 8, 2011. Retrieved July 16, 2011. ^ "「灼眼のシャナⅢ-FINAL- 第Ⅰ巻」Blu-ray & DVD 初回限定版" [Shakugan no Shana Final Volume I Blu-ray & DVD limited edition] (in Japanese). Shakugan no Shana Production Committee. Retrieved April 3, 2012. ^ "灼眼のシャナIII-FINAL- 第VIII巻" [Shakugan no Shana Final Volume VIII] (in Japanese). Amazon.co.jp. Retrieved April 3, 2012. ^ "Geneon Anime Licenses". Anime News Network. July 2, 2006. Retrieved November 24, 2006. ^ "FUNimation Entertainment and Geneon Entertainment Sign Exclusive Distribution Agreement for North America" (Press release). Anime News Network. July 3, 2008. Retrieved July 22, 2008. ^ "Shana: Box Set". Amazon.com. Retrieved April 3, 2012. ^ "Shakugan No Shana Box Set (Viridian Collection)". Amazon.com. Retrieved April 3, 2012. ^ "Shakugan no Shana DVD/Blu-ray Season 1 (Hyb)". The Right Stuf International. Archived from the original on July 9, 2013. Retrieved May 16, 2012. ^ "Funimation Calendar Monday, September 10, 2012". Funimation Entertainment. Archived from the original on September 9, 2012. Retrieved September 9, 2012. ^ "Shakugan no Shana". Madman Entertainment. Retrieved September 12, 2012. ^ "Shana Volume 1". MVM Films. Archived from the original on March 5, 2009. Retrieved September 12, 2012. ^ a b "Funi Adds Live Action Moyashimon Live Action, More". Anime News Network. July 2, 2010. Retrieved July 3, 2010. ^ "New York Comic-Con 2011 - FUNimation Panel". Anime News Network. October 14, 2011. Retrieved April 3, 2012. ^ "Funimation Reveals Shakugan no Shana English Dub Cast". Anime News Network. August 17, 2012. Retrieved September 12, 2012. ^ 川田まみ/緋色の空 [Mami Kawada / Hishoku no Sora] (in Japanese). Geneon Universal Entertainment. Retrieved April 3, 2012. ^ "Kotoko/being" (in Japanese). Geneon Universal Entertainment. Retrieved April 3, 2012. ^ 高橋洋子 / 夜明け生まれ来る少女 [Yoko Takahashi / Yoake Umarekuru Shōjo] (in Japanese). Geneon Universal Entertainment. Retrieved April 3, 2012. ^ 石田燿子/紅（あか）の静寂 [Yoko Ichida / Aka no Seijaku] (in Japanese). Geneon Universal Entertainment. Retrieved April 3, 2012. ^ "灼眼のシャナ original sound track" [Shakugan no Shana original sound track] (in Japanese). Neowing. Retrieved April 3, 2012. ^ "「天壌を翔る者たち」 Love Planet Five" ["Tenjō o Kakeru Monotachi" Love Planet Five] (in Japanese). Shakugan no Shana Production Committee. Retrieved April 3, 2012. ^ "川田まみ/『赤い涙/Beehive』" [Mami Kawada / "Akai Namida / Beehive"] (in Japanese). Geneon Universal Entertainment. Retrieved April 3, 2012. ^ 劇場版「灼眼のシャナ」 オリジナルサウンドトラック [Shakugan no Shana Film Original Soundtrack] (in Japanese). Shakugan no Shana Production Committee. Retrieved April 3, 2012. ^ a b "川田まみ/Joint" [Mami Kawada / Joint] (in Japanese). Geneon Universal Entertainment. Retrieved April 3, 2012. ^ a b "Kotoko/Blaze" (in Japanese). Geneon Universal Entertainment. Retrieved April 3, 2012. ^ a b "川田まみ/Savia" [Mami Kawada / Savia] (in Japanese). Geneon Universal Entertainment. Retrieved April 3, 2012. ^ "灼眼のシャナII　オリジナルサウンドトラック" [Shakugan no Shana II Original Soundtrack] (in Japanese). Shakugan no Shana Production Committee. Retrieved April 3, 2012. ^ "川田まみ/Prophecy" [Mami Kawada / Prophecy] (in Japanese). Geneon Universal Entertainment. Retrieved April 3, 2012. ^ "川田まみ/Linkage" [Mami Kawada / Linkage] (in Japanese). Geneon Universal Entertainment. Retrieved April 3, 2012. ^ ""Light My Fire" Kotoko" (in Japanese). Shakugan no Shana Production Committee. Retrieved April 3, 2012. ^ "「Serment」 川田まみ" ["Serment" Mami Kawada] (in Japanese). Shakugan no Shana Production Committee. Retrieved April 3, 2012. ^ ""I'll believe" Altima" (in Japanese). Shakugan no Shana Production Committee. Retrieved April 3, 2012. ^ ""One" Altima" (in Japanese). Shakugan no Shana Production Committee. Retrieved April 3, 2012. ^ a b "灼眼のシャナ Assorted Shana Vol.I" [Shakugan no Shana Assorted Shana Vol.I] (in Japanese). Shakugan no Shana Production Committee. Retrieved April 3, 2012. ^ "灼眼のシャナ Assorted Shana Vol.II" [Shakugan no Shana Assorted Shana Vol.II] (in Japanese). Shakugan no Shana Production Committee. Retrieved April 3, 2012. ^ "灼眼のシャナ Assorted Shana Vol.III" [Shakugan no Shana Assorted Shana Vol.III] (in Japanese). Shakugan no Shana Production Committee. Retrieved April 3, 2012. 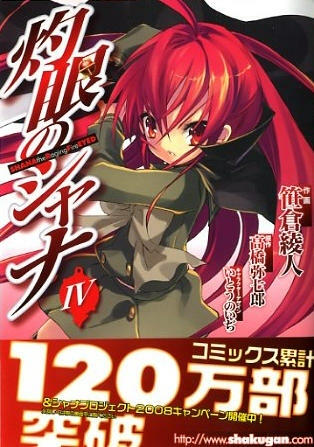 ^ "灼眼のシャナII SPLENDIDE SHANA Vol.1" [Shakugan no Shana II Splendide Shana Vol.1] (in Japanese). Shakugan no Shana Production Committee. Retrieved April 3, 2012. ^ "灼眼のシャナII SPLENDIDE SHANA Vol.2" [Shakugan no Shana II Splendide Shana Vol.2] (in Japanese). Shakugan no Shana Production Committee. Retrieved April 3, 2012. ^ "灼眼のシャナII SPLENDIDE SHANA Vol.3" [Shakugan no Shana II Splendide Shana Vol.3] (in Japanese). Shakugan no Shana Production Committee. Retrieved April 3, 2012. ^ "灼眼のシャナF SUPERIORITY SHANAⅢ Vol.1" [Shakugan no Shana F Superiority Shana III Vol.1] (in Japanese). Shakugan no Shana Production Committee. Retrieved September 13, 2012. ^ "灼眼のシャナF SUPERIORITY SHANAⅢ Vol.2" [Shakugan no Shana F Superiority Shana III Vol.2] (in Japanese). Shakugan no Shana Production Committee. Retrieved September 13, 2012. ^ a b "灼眼のシャナF SUPERIORITY SHANAⅢ Vol.3" [Shakugan no Shana F Superiority Shana III Vol.3] (in Japanese). Shakugan no Shana Production Committee. Retrieved September 13, 2012. ^ "灼眼のシャナ-BEST-" (in Japanese). J.C.Staff. Retrieved November 30, 2017. ^ 電撃文庫メルマガ [Dengeki Bunko Mail Magazine] (in Japanese). ASCII Media Works. Retrieved April 6, 2012. ^ a b 『灼眼のシャナ』ドラマディスク　特別通販!! [Shakugan no Shana Drama Disc Special Mail Order!!] (in Japanese). MediaWorks. Archived from the original on March 14, 2005. Retrieved April 6, 2012. ^ "Special Drama CD". Animage (in Japanese). Tokuma Shoten (April 2008). ^ a b 家庭用ゲーム開発実績 [Home Game Development Record] (in Japanese). Vridge. Retrieved April 5, 2012. ^ 特典 [Special Favor] (in Japanese). ASCII Media Works. Archived from the original on December 19, 2011. Retrieved April 5, 2012. ^ "電撃SP 灼眼のシャナ" [Dengeki SP Shakugan no Shana] (in Japanese). Amazon.co.jp. Retrieved April 5, 2012. ^ a b c d "System" (in Japanese). ASCII Media Works. Archived from the original on December 19, 2011. Retrieved April 5, 2012. ^ "灼眼のシャナ DS" [Shakugan no Shana DS] (in Japanese). ASCII Media Works. Archived from the original on December 19, 2011. Retrieved April 5, 2012. ^ "灼眼のシャナ | ニンテンドーDSソフト『電撃学園RPG CROSS of VENUS』　Official Web Site" [Shakugan no Shana | Nintendo DS Soft "Dengeki Gakuen RPG Cross of Venus" Official Web Site] (in Japanese). ASCII Media Works. Retrieved April 27, 2012. ^ "アスキー・メディアワークス、電撃文庫の人気作品の世界を舞台にしたRPG DS「電撃学園RPG Cross of Venus」" [An RPG with Settings from Popular Works from Dengeki Bunko and ASCII Media Works: DS "Dengeki Gakuen RPG Cross of Venus"]. Game Watch (in Japanese). Impress. October 24, 2008. Retrieved May 1, 2012. ^ "Dengeki Bunko: Fighting Climax Game Pits SAO, Shana Casts Against Each Other". September 21, 2013. Retrieved September 22, 2013. ^ "Kadokawa / ASCII Media Works News Release" (PDF) (in Japanese). ASCII Media Works. October 10, 2014. Retrieved October 19, 2014. ^ "灼眼のシャナ IV" (in Japanese). Amazon.co.jp. Retrieved April 5, 2012. ^ a b Theron Martin (March 25, 2007). "Shakugan no Shana GN 1 - Review". Retrieved May 10, 2007. ^ Theron Martin (January 7, 2007). "Shakugan no Shana DVD 2 - Review". Anime News Network. Retrieved May 10, 2007. ^ Theron Martin (February 21, 2007). "Shakugan no Shana DVD 3 - Review". Anime News Network. Retrieved May 10, 2007. ^ Theron Martin (May 10, 2007). "Shakugan no Shana DVD 5 - Review". Anime News Network. Retrieved May 10, 2007. ^ Chris Beveridge. "Shana Vol. #1". Mania. Archived from the original on July 9, 2013. Retrieved May 9, 2007. ^ Chris Beveridge. "Shana Vol. #2". Mania. Archived from the original on July 9, 2013. Retrieved May 10, 2007. ^ Chris Beveridge. "Shana Vol. #3". Mania. Archived from the original on July 9, 2013. Retrieved May 10, 2007. ^ Chris Beveridge. "Shana Vol. #4". Mania. Archived from the original on July 9, 2013. Retrieved May 10, 2007. ^ Theron Martin (April 26, 2012). "Shakugan no Shana III (Final) - Review". Anime News Network. Retrieved January 6, 2013. Look up Appendix:Shakugan no Shana in Wiktionary, the free dictionary.